Want to navigate. Fun activities are open to everyone at the "La Source" campsite. 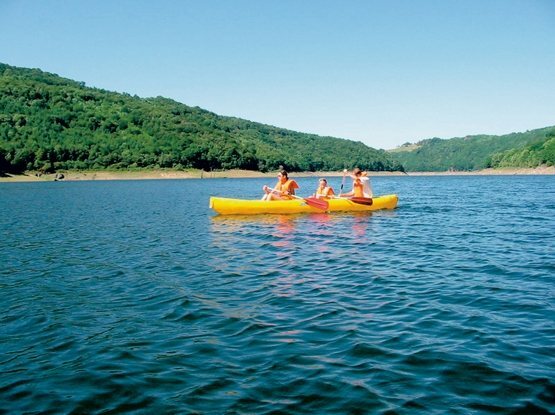 In a sumptuous natural setting, let yourself be surprised by a short trip on a pedalo, canoe or paddles on the beautiful wild and preserved Sarrens lake. The Laussac promontory in a listed site on the banks of Sarrens lake between the Aubrac plateau and the Monts du Cantal. Hire of canoes, paddles and pedal boats for everyone's pleasure on calm waters from the exceptional site of the Presqu'île de Laussac in the Carladez.